While the Legislature was able to avoid a state government shutdown by adopting an operating budget before midnight on June 30, our work remains unfinished. One of the last outstanding pieces of the session is the adoption of our state’s capital budget. This is the budget that creates jobs, and funds local infrastructure projects across our state to the tune of $4.1 billion. 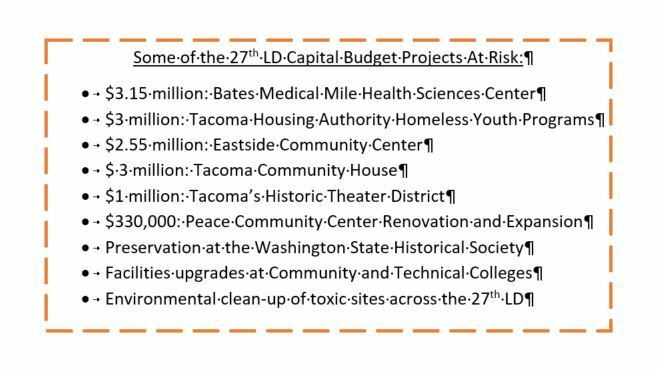 Funds from the capital budget have helped build our schools, update park facilities and community centers, and provide critical toxic environmental clean-up programs in our district. This time around is no different. The House of Representatives has already passed the capital budget 92 to 1 (House Bill 1075). It is now the Senate’s turn to act. The absence of a capital budget would jeopardize thousands of jobs in our state and could stop projects already in progress. If this were to happen, those mothballed projects would likely cost taxpayers more in the future to resume. The Seattle Times recently wrote on this issue with a focus on the construction of the new Burke Museum in Seattle. The potential damage to our district would be just as devastating. While the capital budget is usually the “feel good budget” because it creates jobs in every community across the state, the Republican-led Senate is refusing to bring the capital budget for a vote without their fix to what’s called the Hirst decision – a State Supreme Court decision that has to do with water rights and rural well usage. Senate Republicans are now holding the capital budget hostage and are refusing to negotiate a possible fix to the Hirst decision. This is an irresponsible and dangerous approach to take that puts all communities across the state at risk for losing critical job-creating infrastructure investments. Our state needs the capital budget. It’s time for Senate Republicans to pass the capital budget for the benefit of all Washingtonians. The Third Special Legislative Session will end on July 20. I will continue to meet with community members and will work to encourage my colleagues to pass a capital budget given the time we have left.